have been bashing particles together millions of times per second in hopes of generating exotic, never-before-seen particles. These facilities, such as the Large Hadron Collider (LHC) at CERN laboratory in Switzerland, generate so much data that only a tiny fraction (deemed interesting by an automatic selection process) can be kept. A network of hundreds of thousands of computers spread across 36 countries called the Worldwide LHC Computing Grid stores and processes the 25 petabytes of LHC data that were archived in a year’s worth of collisions. 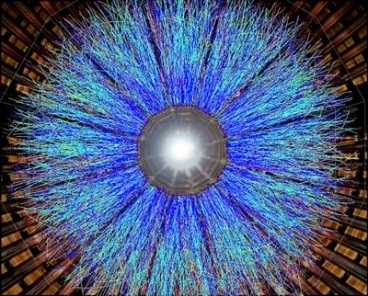 The work of thousands of physicists went into finding the bump in that data that last summer was deemed representative of a new subatomic particle, the Higgs boson. A single sensor for the world’s largest digital camera detected light making its way through wind, air turbulence, and Earth’s atmosphere, successfully converting the light into a glimpse of the galactic wonders that this delicate instrument will eventually capture as it scans the night sky. When installed in the camera of the Large Synoptic Survey Telescope (LSST), these sensors will convert light captured from distant galaxies into digital information that will provide unprecedented insight into our understanding of the universe. Design Engineer Justine Haupt (left) and Postdoctoral Research Associate Dajun Huang (right) prepare a test chamber that scientists in the Instrumentation Division are are using to evaluate the digital sensors they are designing for the Large Synoptic Survey Telescope, which is scheduled to see “first light” in 2020, and start surveying in 2022. But the sensor wasn’t on the telescope yet; it was in a clean room at the U.S. Department of Energy’s (DOE) Brookhaven National Laboratory. And the “atmosphere” was being projected from a custom piece of glass made to replicate what the sensor will actually see once it is part of the camera inside the LSST, which every three days will survey the entire night sky visible from its location atop a mountain in Chile. The meticulous laboratory test at Brookhaven was one of many that scientists in the Lab’s Instrumentation Division are conducting on the 201 sensors they are designing for the digital “film” of the telescope’s camera. Scheduled to see “first light” in 2020, and start surveying in 2022, the LSST will ultimately survey 20 billion galaxies and 17 billion stars in a 10-year period. . In working on sensors for the camera, Brookhaven is partnering with dozens of public and private organizations, including universities, national laboratories, and Google, Inc., to make the LSST a reality. The project is jointly sponsored by the National Science Foundation (NSF) and DOE’s Office of Science. NSF leads the overall LSST effort, while DOE is responsible for providing the camera, with the DOE-supported effort led by the SLAC National Accelerator Laboratory. I think it will be an important chapter in the history of physics. The data gathered from those distant galaxies will offer scientists insight into the seemingly unreal: the dark matter and dark energy that in fact comprise more than 95 percent of our universe (the planets, stars, and other visible matter making up a mere 5 percent). Dark energy, the mysterious force that is accelerating the universe’s expansion, only manifests itself by its effects on large-scale cosmic structures. Dark matter, invisible on its own, can be measured by observing how light bends around it. Understanding these strange concepts and their role in cosmic acceleration are among the “science drivers” recently identified by a panel reviewing priorities in particle physics, which recommended that DOE’s work on the LSST camera go forward no matter what funding scenario the field may face. LSST’s incredible precision and sensitivity will give scientists access to both. To unlock the mysteries of dark energy, LSST needs to be able to measure redshift, a phenomenon observed when the wavelengths of light emitted by galaxies receding at the distant edges of space appear to stretch out, or shift to the red end of the light spectrum. Most galaxies to be detected by LSST are faint and far away, at the limits of current sensor technology for measuring redshifts. So O’Connor said his team needed to design the LSST camera sensors with a much thicker layer of silicon and entirely new electronics. But the LSST won’t just be for scientists. The general public will be able to access its images through planned projects such as adopting a patch of sky to monitor and track changes, and interacting with a time-lapse movie shown in science centers depicting a decade of observation. The telescope’s imaging powers will also join the host of other instruments used to detect exploding supernovae, and asteroids that could hit our planet, giving scientists more warning before they come close to Earth. 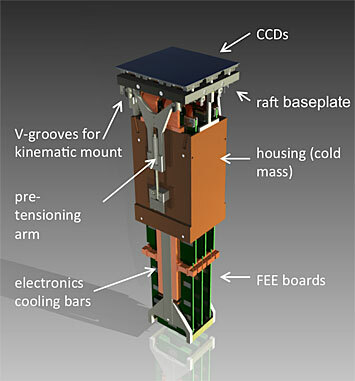 A design of a single raft tower housing the charge-coupled devices (CCDs) — sensors that convert light captured by the telescope into an electrical charge representing a specific detail that a computer can turn into a digital picture. The full camera will have 21 raft towers. The LSST sensors that the Brookhaven scientists are designing, building, and testing are known as charge-coupled devices (CCDs). Each pixel on a CCD converts light captured by the telescope into an electrical charge representing a specific detail that a computer can turn into a digital picture. LSST’s CCDs will capture deep space in unprecedented detail with 3.2-gigapixel sensors — that’s nearly 200 times larger than a high-end consumer camera. Each CCD operates individually, but they will all work together to render a complete image. Nine CCDs sit in a “raft,” or support structure, with their electronics packed underneath. The modularity that the LSST gains because of these rafts will allow for the incredibly quick sky surveys — reading 3 billion pixels in 2 seconds. It will also enable easier telescope maintenance since scientists can fix a single CCD instead of fixing the whole system, which will come in handy when the rafts are housed in a vacuum chamber kept at -100 degrees Celsius inside the telescope. The modularity of the rafts will also be a benefit during the installation and testing of the telescope base. Typically, when scientists build a telescope, they use a placeholder camera to test whether the mount and optics are working properly. Later, they install the full camera and sensors, after those instruments have undergone their own functional tests. But O’Connor said the LSST team will be able to use a single raft for initial testing on the mountain, allowing the scientists to measure the success of these components on the telescope itself. To capture the clearest and most extensive picture of the cosmos, the CCDs must lie perfectly flat and have no more than a 250 micron (millionth of a meter) space between them. This requires painstaking assembly at Brookhaven, but at some point the sensors have to get to California to join the other parts, and then to Chile for operation. Mechanical engineers at Brookhaven are designing a stabilized shipping container to transport the sensitive CCDs across the country and continents. By the end of 2014, O’Connor said, his team hopes to have the first fully functional raft completed and tested. After that, he said, it will take four years to build and test the rest of the CCD rafts, which is on track to meet the “first light” deadline. For more information, go to http://www.lsst.org. DOE’s Office of High Energy Physics funds the LSST camera development. See the full article http://www.symmetrymagazine.org/article/june-2014/getting-the-jump-on-big-data-for-lsst. It will be the mother of all telescopes, and you can bet it will do for astronomy what genome sequencing is doing for biology. The clumsy, if utilitarian, name of this mirrored monster is Large Synoptic Survey Telescope, or LSST. You can’t use it yet, but a peak in the Chilean Andes has been decapitated to provide a level spot for placement. This robotically operated sky-eye, with an aperture of 8.4 meters, should be up and running six years from now. OK, but so what? After all, there are many new telescopes rolling down the pike these days, some of which will boast far larger optics than the LSST. The difference is in the way this scope will sponge data from the sky, and distribute it to the world. The LSST will be the first instrument designed from the pedestal up to work fast, to pile up petabytes of data, and to quickly notice any cosmic phenomena that go bump in the night. That last point is important. Generally speaking, most stuff you see in the heavens doesn’t change very quickly. The stars look the same from night to night. Nebulae and galaxies are dully immutable, maintaining the same overall appearance for thousands or millions of years. Indeed, only the Sun, moon and planets – together with the occasional comet, asteroid or meteor – seem dynamic. The principal reason for the universe’s poker face is that its constituents are far away. Stars careen through space, and galaxies spin at speeds thousands of times faster than a jet plane. But given their distance, you’d need the patience of Job to notice much change in their appearance or position. Nonetheless, we know of celestial circumstances that do change quickly. Stars can explode in minutes. Nearby asteroids capable of cratering your neighborhood can traverse the sky in hours. And surely the most interesting of all are the things we don’t know about: fast phenomena that have escaped our attention simply because astronomers have always used still cameras to photograph the cosmos. And this flick won’t be dull. Juric estimates that ten million transient objects will be photographed each clear night. Many of these will be asteroids prancing through our solar system, and the LSST will catalog millions of them, including 80 percent of the larger ones – rocks as big as a football field or more. Knowing the orbits of these dangerous projectiles will prompt us to deflect those coming our way. To know them is to shove them. That’s a nice bit of insurance against collision catastrophe, but the truly revolutionary thing about the LSST is what it will do for fundamental astronomy. It’s a safe bet that this telescope will discover multitudes of extraordinary events such as colliding neutron stars or other exotica worthy of intense, and immediate, study by others. So part of the LSST’s design is to send out electronic alerts within 60 seconds of sensing one of these fast-action, “bump in the night” events. With this laundry list of extraordinary capabilities, and its formidable cache of data, the LSST will revolutionize astronomy. Yes, that’s a cliché, but sometimes clichés are appropriate. Juric notes that, historically speaking, “astronomy has always been a data-starved science.” That’s because the most interesting research topics are inevitably on the edge of visibility, and consequently require using the largest telescopes. The result is a bottleneck. In the not-so-good old days, a working astronomer might get a few nights a year on a world-class instrument, and could generally observe a few dozen or a few hundred objects. Sure, there were published surveys that cataloged reasonably big swaths of the sky, but those data were not always adequate to address the kinds of interesting questions scientists cook up. So big-time astronomers were often intimately dependent on big-time telescopes. The LSST may cause a breakup of that exclusive relationship. After its first decade of operation, this new scope will have an image collection of about 20 billion galaxies and 17 billion stars. The data set will tally hundreds of millions of gigabytes. That’s truly big data, and the good news is that anyone will be able to scour through it – via the laptop in their office, or using their smart phone while waiting for the bus. So here’s the big shift: For four hundred years, the relationship between astronomers and their telescopes has been as fundamental as that between a psychiatrist and his couch. But once the LSST starts digitizing the sky, it will alter the paradigm dramatically. Scientists will interact with data, not with an instrument. Rather than acquiring photos or spectra to prove or disprove their ideas, they will be free to trawl immense quantities of data, and see what falls out. It will be as if biologists and zoologists suddenly had access to detailed information for every single species on Earth (and thousands of examples of each). Think of the sort of investigations even amateurs could make. The LSST will be a game changer, and it could very turn out that the biggest discoveries about the past, present and future of the cosmos will come not from tweedy astronomers, but from the keen and curious non-specialists sitting at home, faced off against their laptops. Galileo would have been stupefied. Design Engineer Justine Haupt is pictured in front of the cryostat she designed for testing LSST’s electro-optic sensor modules. 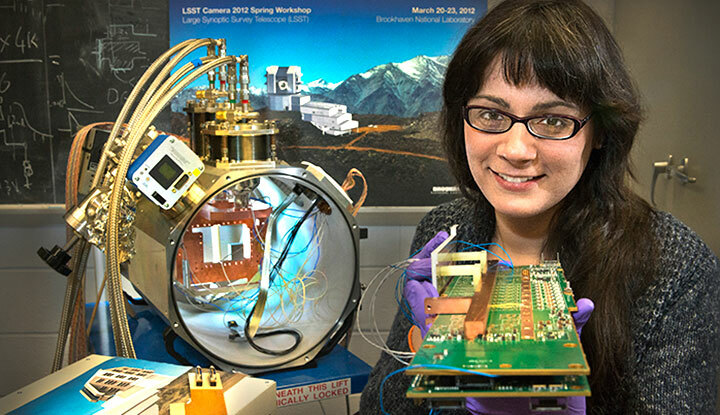 She is holding one of the compact front-end electronic assemblies that will enable the camera to be read out at a remarkable 1.5 billion pixels per second. When completed, the Large Synoptic Survey Telescope (LSST) will be the world’s largest digital camera. It’s been called the widest, fastest, deepest eye of the new digital age. This remarkable telescope, to be stationed on a mountaintop in Chile, promises to cast light on mysteries fundamental to our understanding of the universe. It will scan the sky rapidly and chart objects that change or move, including exploding supernovae and potentially hazardous near-Earth asteroids. LSST’s images will trace billions of remote galaxies allowing probing of mysterious dark matter and dark energy. Its uniquely wide field of view will allow LSST to observe large areas of the sky at once and move quickly between images. It will be able to take more than 800 panoramic images each night and cover the entire sky twice a week. And that is just a brief description. The LSST is fascinating—and Brookhaven Lab is playing a big role in the project. When you meet Justine Haupt you will immediately recognize her calm intelligence and positive attitude. Haupt works in the Lab’s Instrumentation Division designing and building prototypes for the LSST. “She thinks ‘outside the box’ and comes up with methods that will streamline testing of the LSST’s focal plane components,” said Brookhaven researcher Paul O’Connor, who mentors Haupt. “She is inventive, spirited, and remarkably creative. In the four years she has worked at the Lab, she has constructed more than two dozen pieces of equipment, ranging from custom catadioptric lens systems to a microprocessor-controlled, in-vacuum induction motor. She also keeps our group’s 3D printer busy turning out parts for her various creations. She has managed to develop a mastery of mechanical, optical, and electrical design.” For her “impressive range of excellence” Haupt received the 2014 Rising Engineering Star award from Mouser Electronics and Design News. 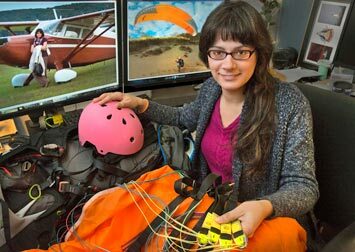 At work, Justine Haupt designs and builds prototypes for the LSST, but in her spare time this design engineer takes to the sky in a plane or paragliding. You might think work would keep Haupt busy enough, but the young researcher takes her quest for knowledge of the sky and our universe a step further. In her spare time, she is an avid paragliding pilot. She got her pilot’s license at age 18, has performed some flying acrobatics, and holds an FAA certified Advanced Ground Instructor rating. She refurbished the avionics of a 1947 Stinson Voyager (a single-engine plane) and installed a new intercom and strobe system. She volunteers and sits on the board of directors at the Custer Observatory, located on the east end of Long Island in Southold, where she routinely reviews and re-engineers the instrumentation for the largest telescope on Long Island. In addition, Haupt volunteers at the Laboratory giving talks to students and visitors about her work. She also finds time to play piano, trombone, and do some fiddling during her lunch hour with fellow employees and musicians, Paul O’Connor, Peter Siddons, Sean McCorkle, and Cindy Salwen. “We casually call ourselves the Stochastic Orchestra and have performed at venues like the Custer Observatory, but mostly we just enjoy meeting at lunchtime and jamming,” said Haupt. “For fun,” she added, “I’ve been working on developing a new holographic projection technique and exploring an idea for a new class of solar astronomy instrumentation. “A 3.2 billion-pixel digital camera designed by SLAC is now one step closer to reality. The Large Synoptic Survey Telescope camera, which will capture the widest, fastest and deepest view of the night sky ever observed, has received “Critical Decision 1” approval by the U.S. Department of Energy (DOE) to move into the next stage of the project. The effort to build the LSST is led by the LSST Corporation, a non-profit 501(c)3 corporation formed in 2003, with headquarters in Tucson, AZ. Financial support for LSST comes from the National Science Foundation with additional contributions from private foundation gifts, grants to universities, and in-kind support from Department of Energy laboratories and other LSST Member Institutions. In 2011, the LSST construction project was established as an operating center under management of the Association of Universities for Research in Astronomy (AURA). Brookhaven Lab leads the development of the sensors for the LSST, the array of precise and sensitive electronics that capture images within the digital camera. The efficacy of LSST research hinges upon its massive resolution of 3.2 gigapixels – that’s nearly 200 times larger than a high-end consumer camera. The unique charge-coupled device (CCD) sensors, designed in Brookhaven’s Instrumentation Division, are sensitive to light beyond the visible spectrum and have a much faster readout time than those in today’s most advanced astronomical cameras. Brookhaven scientists are constructing a grid of 200 individual sensors, which will act in concert to render a complete image. See the full article from Brookhaven here. Find out more about the LSST starting here. “A U.S. Department of Energy review panel last week gave a glowing endorsement for the SLAC-led project to create the world’s largest digital camera, which will enable a new telescope being built on a Chilean mountaintop to investigate key astronomical questions ranging from dark matter and dark energy to near-Earth asteroids. After two and a half days of presentations and meetings at SLAC, the panel of 19 experts recommended that the 3.2 gigapixel (billion pixel) camera for the Large Synoptic Survey Telescope receive Critical Decision-1 status, the DOE’s project-management milestone that defines a large project’s approach and funding for achieving a specific scientific mission. Once constructed, the Large Synoptic Survey Telescope’s 3.2-billion-pixel camera will be the largest digital camera in the world. Roughly the size of a small car, the camera will take 800 panoramic images each night, surveying the entire southern sky twice a week. These images will enable researchers to create a 3-D map of the universe with unprecedented depth and detail, and could shed light on the fundamental properties of dark energy and dark matter. The camera¹s design team, led by SLAC and Stanford University researchers at the Kavli Institute for Particle Astrophysics and Cosmology, recently reached a key milestone in the project and will undergo a preliminary design review this summer. The camera, which will be built at SLAC, is expected to cost about one third of the nearly $500 million price tag for the new telescope, which is being borne by the DOE and the National Science Foundation, as well as several public and private organizations in the United States and abroad.